German Chancellor Angela Merkel (left) met Mark Zuckerberg, Chairman, CEO and co-founder of Facebook (right) at a UN development summit in New York. As they sat down, Chancellor Merkel’s microphone, still on, recorded Merkel asking Zuckerberg what could be done to stop anti-immigration postings being written on Facebook. 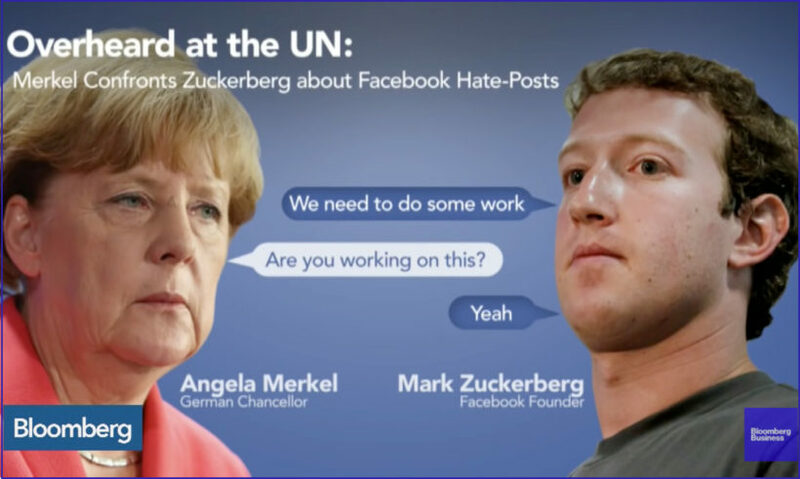 In September, German Chancellor Angela Merkel met Mark Zuckerberg of Facebook at a UN development summit in New York. As they sat down, Chancellor Merkel’s microphone, still on, recorded Merkel asking Zuckerberg what could be done to stop anti-immigration postings being written on Facebook. She asked if it was something he was working on, and he assured her it was. At the time, perhaps the most revealing aspect of this exchange was that the German Chancellor — at the very moment that her country was going through one of the most significant events in its post-war history — should have been spending any time worrying about how to stop public dislike of her policies being vented on social media. But now it appears that the discussion yielded consequential results. Facebook is working with a unit of the publisher Bertelsmann, which aims to identify and then erase “racist” posts from the site. The work is intended particularly to focus on Facebook users in Germany. Of course, Facebook can do what it likes on its own website. What is troubling is what this organization of effort and muddled thinking reveals about what is going on in Europe. The mass movement of millions of people — from across Africa, the Middle East and further afield — into Europe has happened in record time and is a huge event in its history. As events in Paris, Cologne and Sweden have shown, it is also by no means a series of events only with positive connotations. As well as being fearful of the security implications of allowing in millions of people whose identities, beliefs and intentions are unknown and — in such large numbers — unknowable, many Europeans are deeply concerned that this movement heralds an irreversible alteration in the fabric of their society. Many Europeans do not want to become a melting pot for the Middle East and Africa, but want to retain something of their own identities and traditions. Apparently, it is not just a minority who feel concern about this. Poll after poll shows a significant majority of the public in each and every European country opposed to immigration at anything like the current rate. And it just so happens that this idea of “racist” speech appears to include anything critical of the EU’s current catastrophic immigration policy. By deciding that “xenophobic” comments in reaction to the crisis are also “racist,” Facebook has made the view of the majority of the European people (who, it must be stressed, are opposed to Chancellor Merkel’s policies) into “racist” views, and so is condemning the majority of Europeans as “racist.” This is a policy that will do its part in pushing Europe into a disastrous future. Because even if some of the speech Facebook is so scared of is in some way “xenophobic,” there are deep questions as to why such speech should be banned. In lieu of violence, speech is one of the best ways for people to vent their feelings and frustrations. Remove the right to speak about your frustrations, and only violence is left. Weimar Germany — to give just one example — was replete with hate-speech laws intended to limit speech the state did not like. These laws did nothing whatsoever to limit the rise of extremism; it only made martyrs out of those it pursued, and persuaded an even larger number of people that the time for talking was over. In this toxic mix, Facebook has now — knowingly or unknowingly — played its part…. Douglas Murray, a British writer, journalist and commentator, is based in London, England. 1. a) Before reading this post, had you heard anything about this story? b) What type of bias does the American media display by not widely reporting this story? Facebook insists it “does not tolerate hate speech” and is vigilant about taking down such content. But the social-media giant seems to apply a double standard. An Israeli advocacy group sued Facebook in Manhattan Supreme Court last October, claiming it lets jihadists openly recruit on its pages. Now the group — Shurat HaDin-Israel Law Center — says its experiment last week proves its point. It created two nearly identical pages filled with hate-filled rants and blatant incitement to violence. One page was called “Stop Israelis”; the other, “Stop Palestinians.” Then it reported both pages to Facebook. The video prompted several news media inquiries — and Facebook finally pulled the anti-Israel page and issued its no-hate-speech statement. 4. According to a Pew poll, 30% of American adults get their news from Facebook. If Facebook does block these thoughts, or others it judges offensive, what effect do you think it has on a users’ outlook on various news events?